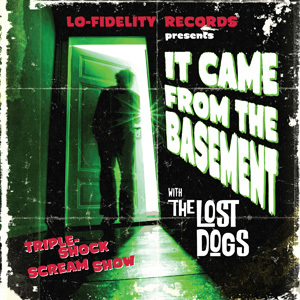 DVD Review: The Lost Dogs, "It Came From The Basement"
The Lost Dogs emerge with a vintage concert for the DVD release, It Came From The Basement. There is a lot of history that has passed between the members of The Lost Dogs, both as a unit and among the individual members of the group, some logging more than forty years making music. That expanse is evident not only in how the band plays their current music, but how they adjust their live sets. , which was a covers album, which covered material each bandmember had written and recorded with their other numerous bands. We’re talking about seven official albums at that juncture, and where usually at that point band members might have a bristling, subsurface disdain for each other (I’ve seen it in bands after three outings, much less seven) the core of the group shares a camaraderie more akin to family than bandmates. The sound on the DVD is very good, and that has as much to do with the controlled area it was recorded in as it does with who recorded it (in this case, exec. producer Jeffrey Kotthoff and Jeff Elbel from the band Ping). The visuals, however, are pretty weird, but in a good way. At first it might be offputting to viewers to find how things were assembled, more like the presentation at a seedy drive-in showing a Roger Corman b-movie than a concert feature. There are jump cuts from song to song as opposed to the usual flow of a live recording, but once you’ve adapted to the eccentricities you can start to appreciate the fun all involved are having. Without these trappings, you would have had footage of the band playing a show in a basement. With this band, that’s all well and good but not visually dynamic (last time I checked, it’s still impossible to get a sweeping crane shot in a basement). For those who simply appreciate well-played tunes by seasoned pros who aren’t at each other’s throats or not simply doing it for a crass reunion check, It Came From The Basement is a solid hour of entertainment. For fans of the band, it’s required viewing.